Seven students from the Russellville City Schools of Russellville, Ala., won first place in the International Rocketry Challenge at the 2015 Paris Air Show on June 19. The U.S. team, sponsored by Raytheon, beat teams from the United Kingdom, who came in second place, and France, who took home third. Competing teams designed, built and launched rockets with a goal of reaching an altitude of exactly 800 feet within a 46- to 48-second flight window. This year’s contest required rockets to separate into at least two sections during flight. The main section, containing a payload of one raw hen’s egg and an altimeter, had to return to the ground safely with a single parachute as its sole recovery device. Scores were determined by how close the rockets approached the required height and time; cracked eggs would disqualify the flight. The U.S. team consists of Cristian Ruiz, 16; Niles Butts, 17; Andrew Heath, 17; Katie Burns, 13; Evan Swinney, 18; Cady Studdard, 14; and Chelsea Suddith, 15. The team achieved a winning flight score of 49.53 and logged an altitude of 824 feet. The students also gave a presentation on their rocket design to a panel of international judges at Raytheon’s air show headquarters. The judges’ score counted for 40 percent of their total competition score. The U.S. took first place in this portion of the challenge as well. The International Rocketry Challenge is the culmination of three separate competitions held annually around the globe: the Team America Rocketry Challenge (TARC) sponsored by the Aerospace Industries Association (AIA) and the National Association of Rocketry (NAR); the United Kingdom Aerospace Youth Rocketry Challenge (UKAYRoC) sponsored by ADS, the UK Aerospace, Defense, Security and Space association; and the French Rocketry Challenge sponsored by Groupement des Industries Francaises Aeronautiques et Spatiales (GIFAS), the French aerospace industries association. Each contest brings together teams of middle and high school students to design, build and launch model rockets with the goal of inspiring young minds to become engaged in science, technology, engineering and math. 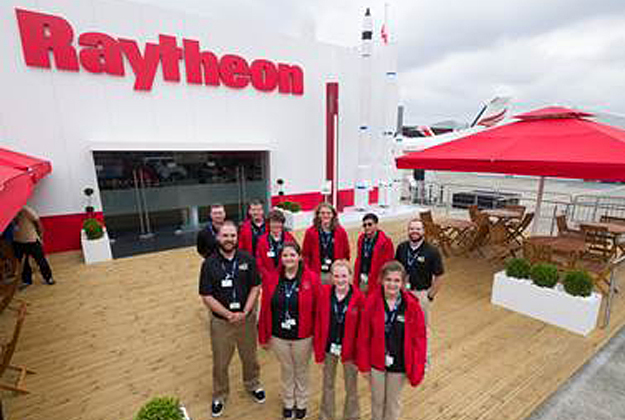 This is the tenth year that Raytheon has supported the U.S. team's trip to the international air show. The program is part of the company’s broad-based MathMovesU® initiative to encourage students to pursue careers in science, technology, engineering and math (STEM). Raytheon's MathMovesU® program is an initiative committed to increasing middle and elementary school students' interest in math and science education by engaging them in hands-on, interactive activities. The innovative programs of MathMovesU include the traveling interactive experience MathAlive!®; Raytheon's Sum of all Thrills™ experience at INNOVENTIONS at Epcot®, which showcases math in action as students design and experience their own thrill ride using math fundamentals; the In the Numbers game, a partnership with the New England Patriots on display at The Hall at Patriot Place presented by Raytheon; the company's ongoing sponsorship of the MATHCOUNTS® National Competition; and the MathMovesU scholarship and grant program. Follow MathMovesU and other Raytheon community outreach programs on Facebook and on Twitter @MathMovesU.